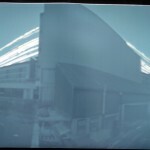 In Nov 2011 we left a pinhole camera taped to the drain pipe in TOG’s yard looking south. So its been up for 4 months. 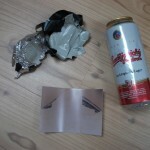 It’s just a beer can with a 1mm hole and a piece of b+w photo paper inside. We took it down today and scanned it in. 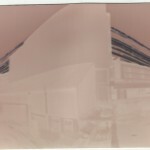 The raw image is upside down and back to front. The “colours” are also inverted. You can see the track of the sun and how it gets higher in the sky, as the days get longer. The gaps are days where there was no sun. After a bit of trickery in GIMP, its right way around and inverted. We have lots of photo paper in TOG if you want to come in and make one. You can leave it in place from days to months and still get a good image. Click on the images for a closer view. This was written by gary. Posted on Wednesday, March 21, 2012, at 3:03 pm. Filed under Uncategorized. Bookmark the permalink. Follow comments here with the RSS feed. Post a comment or leave a trackback. Looks really well did you stick up another one? No, I didn’t get a chance to. I just grabbed the can today when I was passing. Put another couple up, facing different directions.